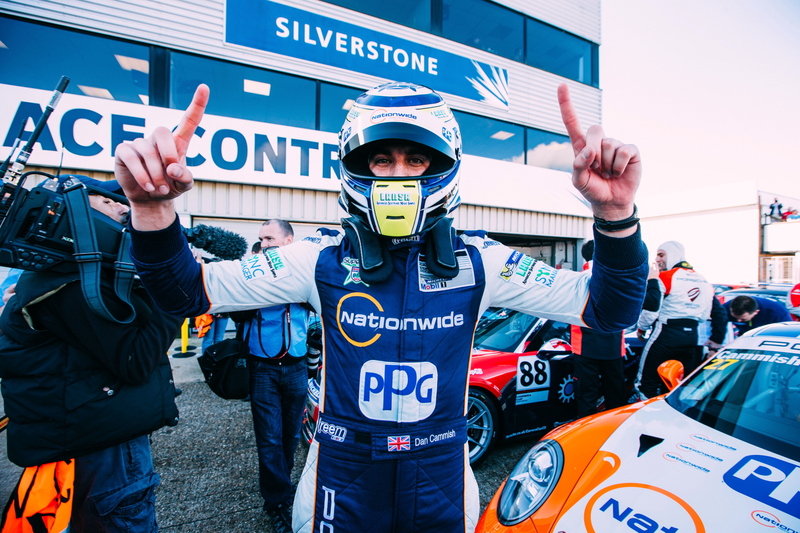 Redline Racing’s Daniel Cammish secured the 2015 Porsche Carrera Cup GB at Silverstone as Dino Zamparelli finally took his first wins in a 911 GT3 Cup car at the penultimate round of the year. Qualifying saw 2012/13 champion, Michael Meadows take pole position for both races at the home of British motorsport, with Zamparelli joining him on the front row for the first time in 2015 after a switch to the GT Marques squad. Zamparelli made good use of his new-found form, leapfrogging Meadows at the start of race one before eking out a slight advantage lap-by-lap to eventually take his maiden Carrera Cup GB win 2.2 seconds ahead of the chasing pack. Zamparelli was understandably delighted with his weekend. Behind, Meadows eventually fell into the clutches of Cammish (who had passed third-placed start, Josh Webster on lap one). The 15th lap saw the championship leader make his move, taking a second place that would see him secure the 2015 title with three races to spare. Webster was never able to challenge Meadows for the final spot on the podium while Tom Sharp came out on top in a battle between himself, Jayde Kruger and Paul Rees for fifth place. With the championship settled, race two was a more frenetic affair, with Meadows this time holding onto his number one spot at the rolling start as Webster slotted in behind having started second on the grid. With 10 wins in 2015, Dan Cammish isn’t used to following other 911 GT3 Cup cars but second place helped him secure the title. Zamparelli ran third and was soon joined by new champion Cammish who had to work his way passed Kruger on lap two to stay in contention with the leading duo around the high-speed 1.64-mile Silverstone National circuit. On lap 14, Zamparelli briefly managed to get ahead of Webster for second but the outgoing champion was quickly back through on the following lap before making a concerted effort to hassle race leader, Meadows. The action came to a head on lap 25 when Webster’s attempt to pass Meadows saw the Samsung SUHD TV Racing driver spin down the order to seventh, leaving Webster to take the win from Zamparelli and Cammish. The flashpoint in race two came when Josh Webster and Michael Meadows made contact while disputing the lead. However, after the race, it was adjudged that Team Parker Racing’s Webster had caused the collision with Meadows, the stewards penalising the Total 911 columnist by 11 seconds, demoting him to seventh, one place behind Meadows. This handed a second victory to Zamparelli to give the Bristolian the perfect start to his new relationship with the GT Marques team. Cammish’s second place meant that he left a Carrera Cup GB round without a win for the first time while third went to Sharp. The final round of the 2015 Porsche Carrera Cup GB takes place around the Brands Hatch Grand Prix circuit on 10-11 October, with Sharp and Zamparelli locked in battle for the £50,000 rookie of the year prize pot. For all the latest Porsche racing news, check out our dedicated motorsport section. 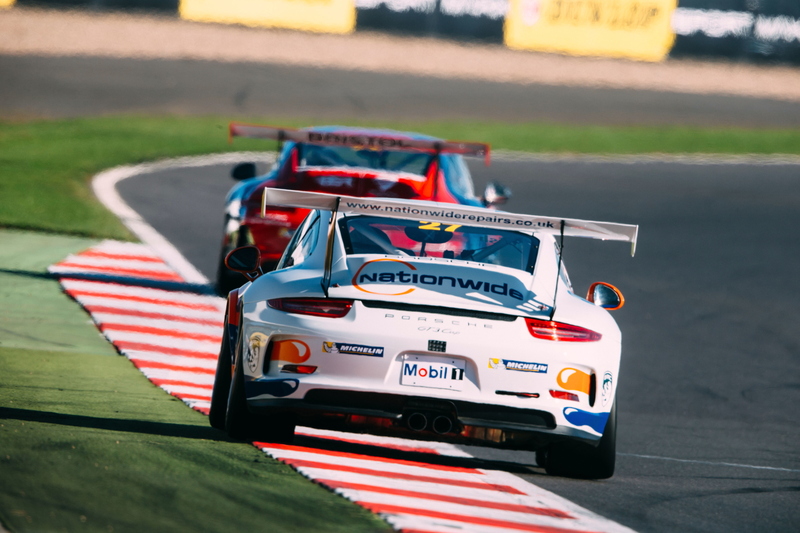 Cammish has utterly dominated the 2015 Carrera Cup GB season with the title just rewards for his efforts.